The word Yamaboko refers to the two types of floats used in the procession: the 23 yama and 10 hoko. 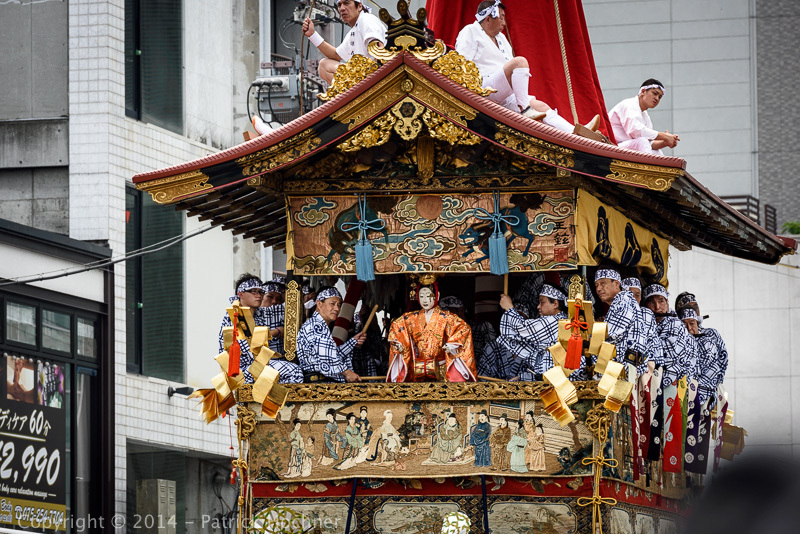 One of the main reasons the Gion Matsuri is so impressive is the enormity of the hoko, which are up to 25 meters tall, weigh up to 12 tons, and are pulled on wheels as big as people. Both yama and hoko are elaborately decorated and represent unique themes. 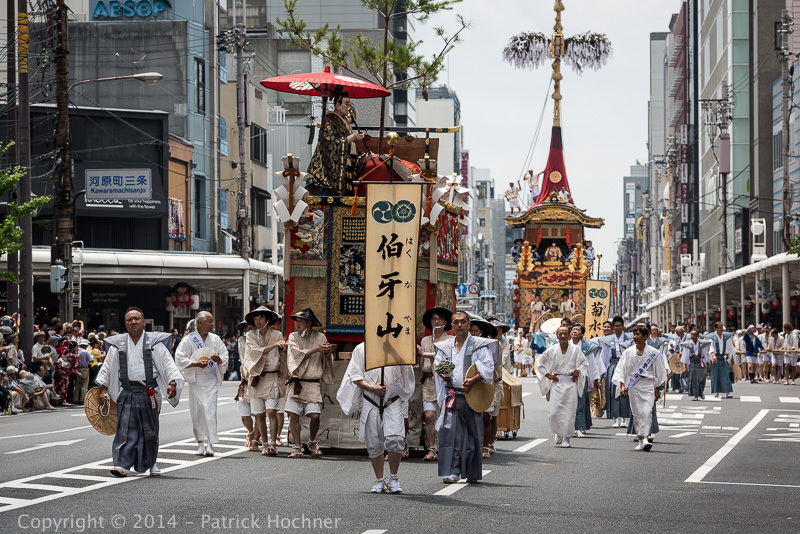 The procession on July 17 featured 23 yama and hoko, including most of the particularly impressive hoko, while the procession on July 24 featured the remaining ten yama and hoko. Another reason for the festival’s impressiveness is its long and almost uninterrupted history. It dates back to 869 as a religious ceremony to appease the gods during the outbreak of an epidemic. Even today, the festival continues the practice of selecting a local boy to be a divine messenger. The child cannot set foot on the ground from the 13th until after he has been paraded through town on the 17th. In 869 Kyoto was struck by a massive epidemic. In order to end the plague and appease the gods, Emperor Seiwa requested the head priest of the Yasaka Shrine to hold a procession to remove the evil spirits from the city. 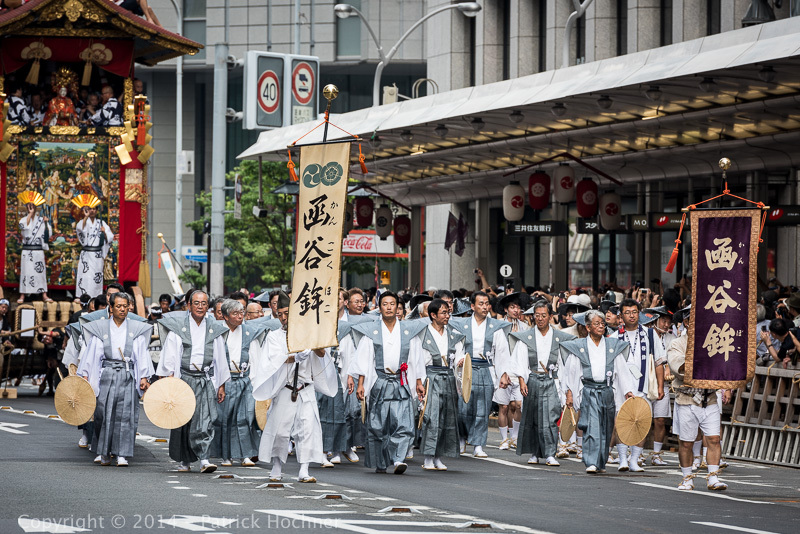 Every year since, on July 17th, the procession is held. At least 32 floats, or pikes, many of them hundreds of years old and all constructed without iron or nails, are drawn through Kyoto’s streets by teams of men in one of Japan’s biggest festivals. The floats are decorated with carvings, statues and precious Gobelin tapestries, and depict scenes from the Buddhist or Shinto religions, Japanese and Chinese history and literature or Noh plays. The largest floats, pulled by teams of up to 100 men in period costumes, weigh more than ten tons. Steering is done by blocking the front wheels with wooden wedges while chanting men pull on stout ropes to maneuver around corners. The procession or Yamaboko Junko is the festival’s peak on the 17th. We arrived early to find a good spot along the way or the procession. We posted ourselves on Shijo street, and after the passage of a first series of floats, we moved around to a few other spots, We got to see a lot of these floats, and mainly the way they were turned around the corners. We also enjoyed the view of all these participants, dressed in historical costumes. It was a very enjoyable festival, despite the heat and the humidity.